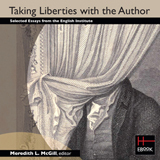 HEB is pleased to announce the release of our latest XML title, Taking Liberties with the Author, edited by Meredith L. McGill and published by the English Institute in collaboration with ACLS. This work is the third born-digital installment in the English Institute's series of publications derived from its annual conferences; it comprises selected papers from the 2010 conference, "Author," held at Harvard University. This volume features five essays, in addition to the editor's introduction, exploring the place of the author in literary discourse. In essays that range from an analysis of authorial disavowal in ancient and medieval rhetorical traditions to an account of corporate authorship as articulated in the Disney-Pixar merger , this volume explores the persistence of the figure of the author as a shaping force in literary criticism. HEB recently published its fourth official white paper, Perception Analysis of Scholarly E-Books in the Humanities at the Collegiate Level by Lee Walton and Edward Reiner, which is now available on our website here and as a downloadable PDF. This report examines perceptions and preferences among academic librarians regarding e-book offerings in the humanities, and provides an overview of currently available digital scholarly resources. HEB thus continues to make available its findings from studies and surveys conducted to investigate the evolution of digital scholarship since the launch of the collection in 2002. Our previously released reports detailing the results of these efforts can all be found on our website: http://humanitiesebook.org/help/white-papers.html.